Adapted by Andy Taylor from a display given by Dr John Pitts. 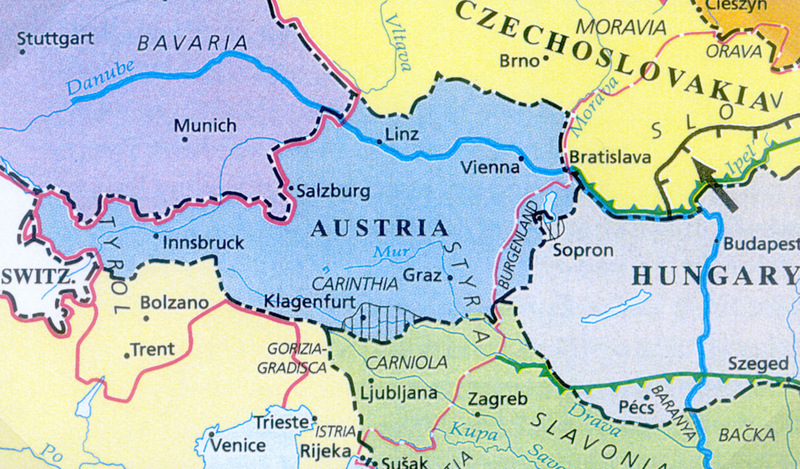 "L’Autriche, c’est ce qui reste" - "Austria consists of what is left over." Georges Clemenceau, 1918. When Emperor Charles I withdrew on November 11 1918 the Austro-Hungarian Empire was in the process of disintegration. The disruption resulted in (1) attempts by rump Austria (the new "Deutsch-Osterreich") to unite with Germany in Salzburg and the Tyrol; (2) a foreign occupation and plebiscite in Carnthia; (3) the formation of local revolutionary committees in many localities; and (4) the assignation of the Burgenland to Austria. Attempts to become part of a new German republic were forbidden by the Allies. Such abnormal political and economic conditions created the necessity for emergency measures and stamp issues, as well as the opportunity for unnecessary and fraudulent issues. The display presented emergency and local issues most of which, although printed contrary to regulations, were actually and undoubtedly used in the mails. Some were ordered by the provincial governments (Tirol and Salzburg), others owed their existence to political or private intervention. Forgeries have been identified by Friedl and Pollak, and on the basis of their expertise the items displayed are considered to be genuine unless otherwise indicated. Auxiliary Post of Meran, 1918. Local lssue of Knittelfeld, December 7-8, 1918. Land Tirol, December 12, 1918 - January 20, 1919. 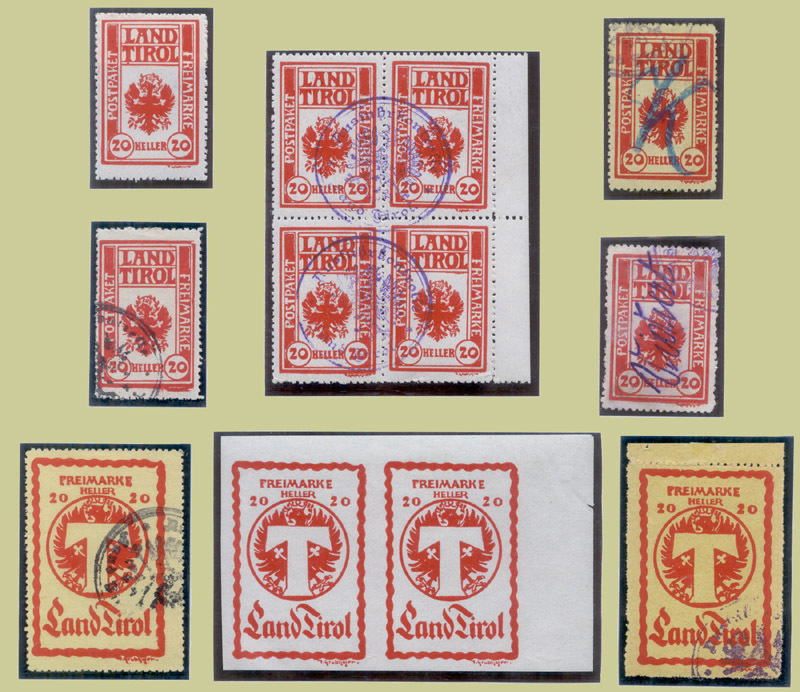 Tirol Parcel Control Stamps, 1919 - 1921. Local Liberation Issue, Radkersburg, July 26, 1920. Local Liberation Issue, Spielfeld, August 20, 1920. Plebiscite in Carinthia, September/October 1920. Austria or Yugoslavia? Eastern Tirol Plebiscite, October 17, 1920. Tirol Plebiscite, April 24, 1921. Annexation by Germany? 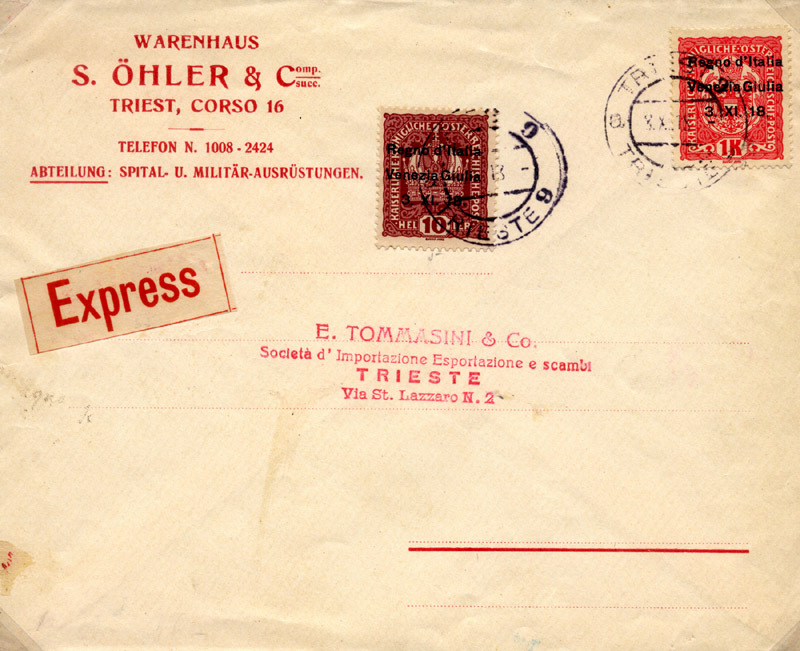 Following the occupation of South Tyrol by the Italian armies late in 1918, the postal service was suspended and the Chamber of Commerce of Meran, 35km NW of Bolzano, was authorised to establish a local post. First issue, November 25, 1918. Second issue, November 30, 1918 (?). The 2H, 5H and 10H values were, nominally, for newspapers, postcards and letters respectively. Local additional franking to ensure delivery by the Chamber of Commerce following withdrawal by the Austrian administration. Known used examples are cancelled by the Algund cds, as in the example above which appears to pre-date the published (but uncertain) issue date by 2 days. The 10 Heller adhesive is tied by the faint oval hand-stamp of the Meran Chamber of Commerce "Gremium der Kaufmannschaft des Kurbezirkes Meran". For over 300 years before 1918, the areas that were to become Czechos1ovakia, namely Slovakia and Bohemia and Moravia, had been ruled over by the Austro-Hungarian Empire. The beginnings of the new state came from an agreement between Masaryk, a Czech, and Stefanilk, a Slovak who inaugurated a movement for independence. A provisional government in exile was formed in September 1918 and Czech independence was declared in October. The Revolutionary Committee in Prague immediately authorised the overprinting of the then current postage issues of Austria as well as the printing of the first stamps of the new Republic. 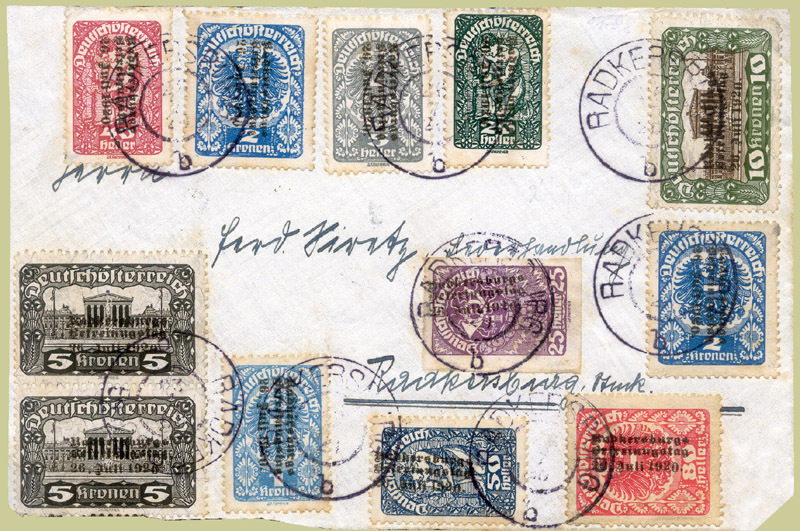 The overprinted stamps included the Hluboka provisionals; they were not recognised by the Central Post Authority in Prague, and their importance was probably political rather than postal. 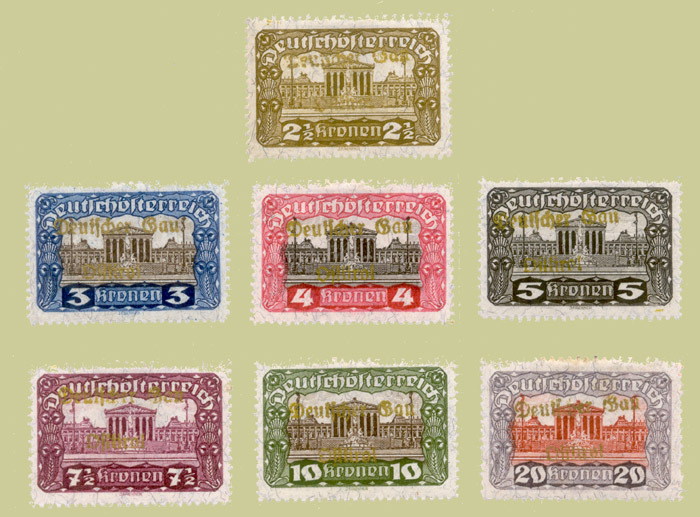 The postage stamps of the old Monarchy were still in use after the overthrow of 1918, and so the District Committee of Public Welfare of Knittelfeld in Styria decided, on the initiative of the local soldiers council, to overprint these stamps "Republik / Deutsch / Oesterreich", thus drawing attention to the new Republic. The size of the overprint was 11 x 16.5mm and this helps to identify forgeries. 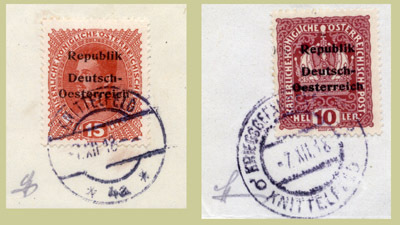 The overprinted stamps were issued on December 7 and 8, 1918, at the office of the Public Welfare and also by the soldiers’ District Council for the POW camp of Knittelfeld. The latter used its own Kriegsgefangenenlager / Knittelfeld cancel. The two types of cancel are shown, dated 7.XII.18. Below them is a registered letter from Knittelfeld to Graz dated 8.XII.18. Efforts of nationalists to secede from Austria and join Germany led to the overprinting of the then current postage stamps with a Tirolean eagle in support of demands for a National Assembly. Stamps were overprinted in violet-black using a rubber hand-starnp. The issue was sold at face value. Postal use was forbidden after January 20, 1919. To control parcels containing goods destined for foreign countries, the export of which was forbidden, the Tyrolean Government ordered on April 17th 1919 their control in both postal and rail transportation. 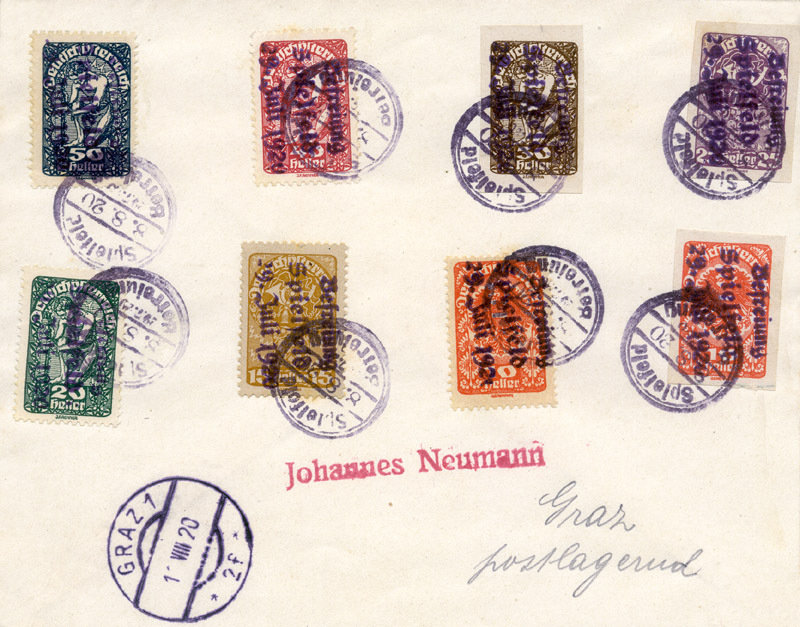 Originally it was intended to use small stamps for postal parcels and large stamps for railway parcels but this arrangement was short-lived. To mark the evacuation of Yugoslav troops from Radkersburg in Styria, the State Printing Works in Vienna had planned an overprint of Austrian stamps. They were unable to carry out the job and, at the last moment, the local Liberation Committee stepped in. There are two printings of the 3-line overprint approved by the Ministry of Communications; the first (black, dull and blurred) was made locally at the print shop at Semlitsch, and the second, sharp and shiny, was made at the Deutsche Vereinsdruckerei, Graz. Both read "Radkersburgs / Befreinugstag / 26. Juli 1920", with the letters ‘n’ and ‘u’ in the second word being deliberately switched by both printers to deter falsifications. As with Radkersburg, Spielfeld in Tyrol introduced an overprint on the regular postage stamps to celebrate the evacuation of the Yugoslav troops on August 7, 1920. This was also authorised by the Ministry of Communications, and the overprinting was effected by hand-stamp by the Liberation Committee on any postage stamps submitted to it against a payment of 2 and 5 Kronen for low and high denominations respectively. The overprint read "Befreiung / Spielfelds / 29. Juli 1920". 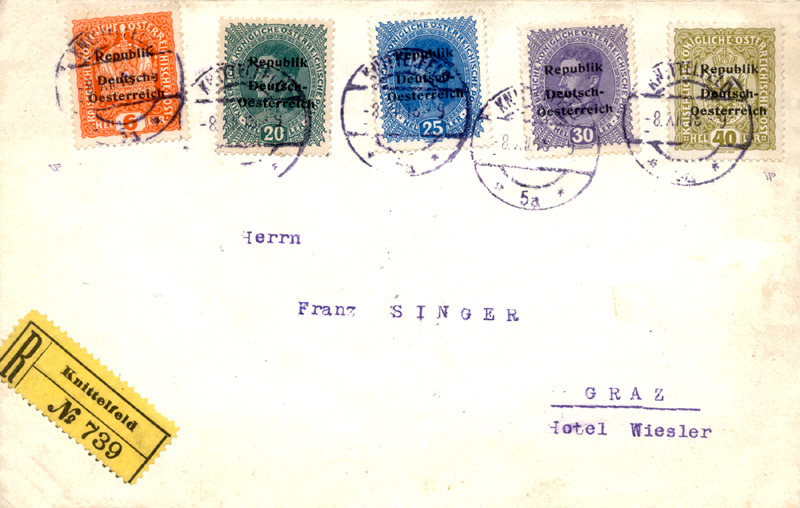 Letter to Graz dated 8.8.20, with overprint showing the variety ‘missing s’. On about half the issues the final s in Spielfelds of the 3-line overprint is missing because of a failure of the primitive hand-stamp. 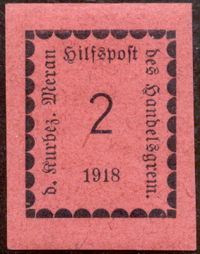 The private commemorative cancellation was done with a circular rubberstamp supplied by the Liberation Committee with "Spielfeld / Befreiung" around the circumference and the dates "8.8.20" and "29.7.1920" across the centre. 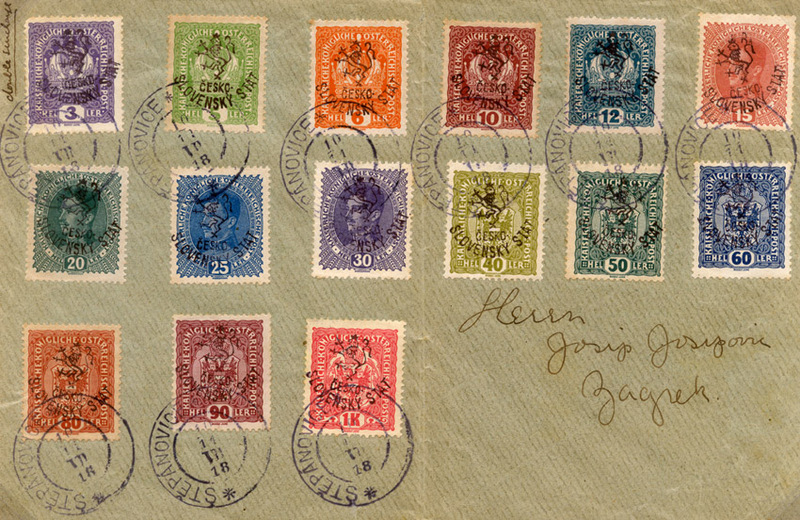 The cancellation of current postage stamps with the small circular hand-stamp was not authorised and after August 8th 1920 the overprinted stamps were invalid. On October 12th 1920, the Ministry of Communications declared that the overprint was done without the approval of the postal authorities, and it therefore had no official standing. 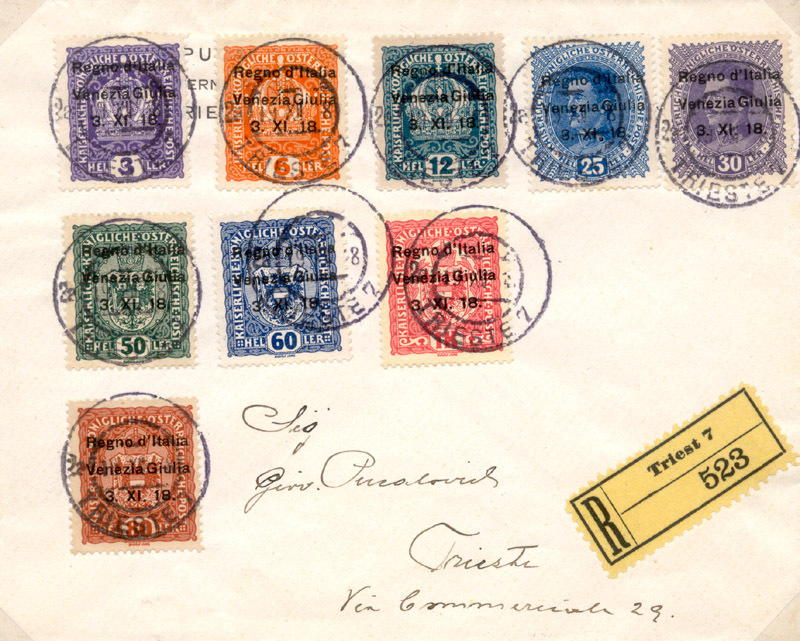 The official postal cancellation for the regular mail was the Yugoslav "SPILJE" obliterator, seen on the cover below sent to Wien, dated 10.VIII.20. Private commemorative cancellation. double circle, diameter 23½mm, "8.8.20". Yugoslavian official postal cancellation, circular, diameter 27¼mm, "SPILJE /10. VIII.20 / * b *"
The plebiscite in the province of Carinthia was to decide whether to join Austria or Yugoslavia, and special plebiscite stamps were designed but not officially issued. lnstead the government reprinted the then current stamps in different colours and added an overprint. In spite of this, the designer of the non-accepted stamps had 1000 sets printed as essays. Although distributed, they served no postal purposes. 'Taking the Oath' and the 'Carinthian Shield' - propaganda essays. Because of the disputed border, some deemed Carinthia to be a part of the Kingdom of Serbs, Croats and Slovenes (SHS). 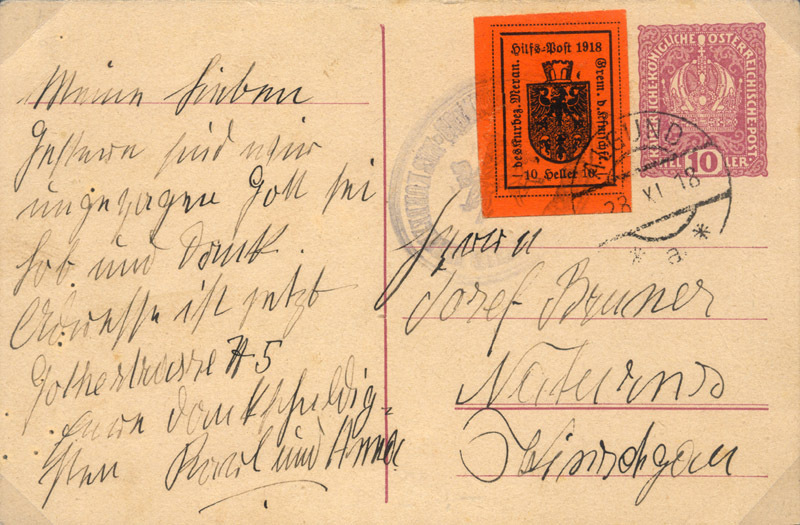 The card above carries the 'SHS' postmark and censor of "Borovije" (Yugoslavian name for the Austrian town of Ferlach, just 16km south of Klagenfurt) with the senders address clearly stating "Ferlach Kärnten / SHS". The card was sent 31.VII.20 in the run-up to the plebiscite. 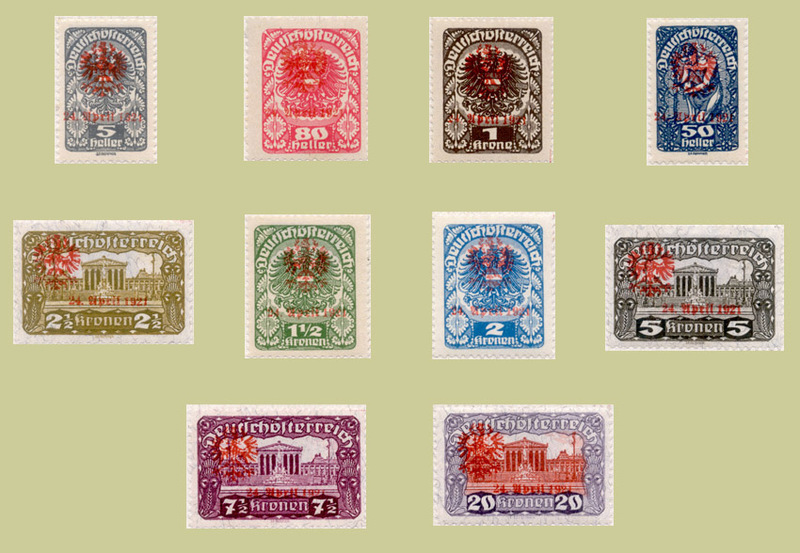 Yugoslavia also introduced a series of its own special stamps - surcharges on the 1919 imperforated newspaper stamps of Slovenia. Each had a different surcharge, but all included the letters K, G, C, and A, which signified "Karinthian Governmental Commission, Zone A". All the plebiscite stamps were sold at post offices at three times the face value. 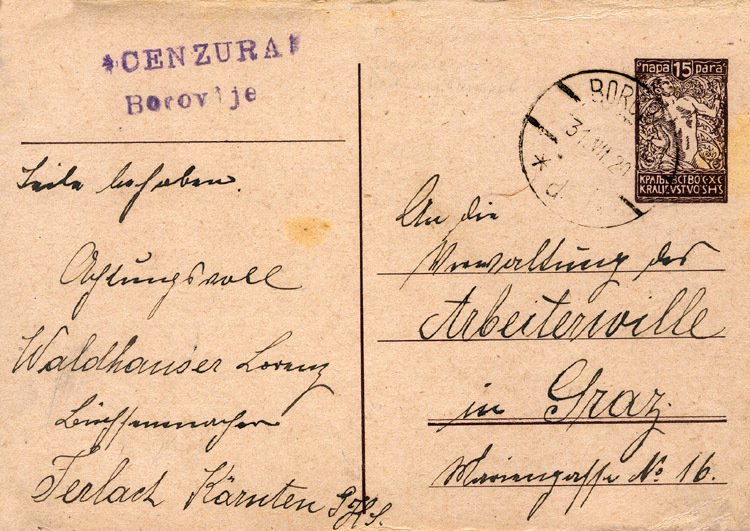 Local registered letter, Maribor 2, 5.X.20. For the purpose of the plebiscite, the disputed territory was divided into the south, Zone 1, and the north, Zone II. The plebiscite was to be held first in the south, then in the north three weeks later but only if the south had voted to join Yugoslavia. A 95% turnout voted 59% for Austria and 41% for Yugoslavia, so the second vote did not take place. 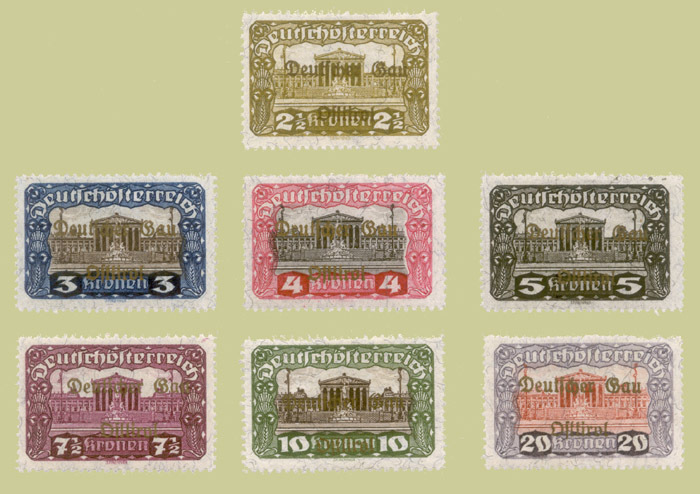 In Lienz the Plebiscite Committee for the Eastern Tirol ordered an overprinting of Renner Republic stamps with the words "Deutscher Gau Osttirol", and on October 16th 1920, these stamps were sold or distributed on the occasion of the proclamation of the German Gau (district) Osttirol in Lienz. These stamps were no more than private propaganda essays. Despite a selling price of 500 Kronen (face value 121.20 Kronen) they were quickly bought up. They were overprinted in gold; such was the demand for the first issue that a reprint in dull gold, consisting of 1000 sets, was supplied. 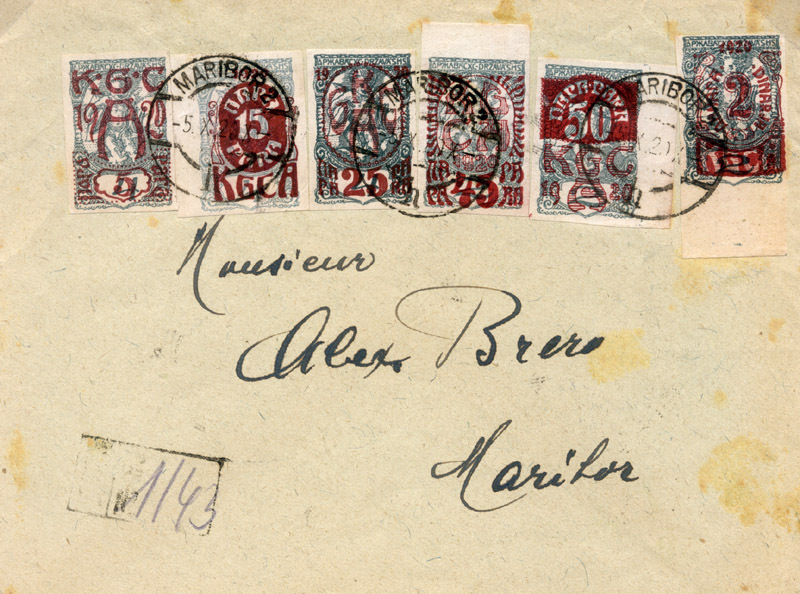 Mail bearing first issue and reprint stamps was treated as unfranked. Tirol Plebiscite, April 24th 1921. Annexation by Germany? On April 24, 1921, a plebiscite was held in the Tirol to decide on a possible link up with Germany. Ihe plebiscite committee, with the consent of the Tirolean government, instructed the Innsbrück printing works to overprint the then current postage stamps with a lithographed eagle and date. 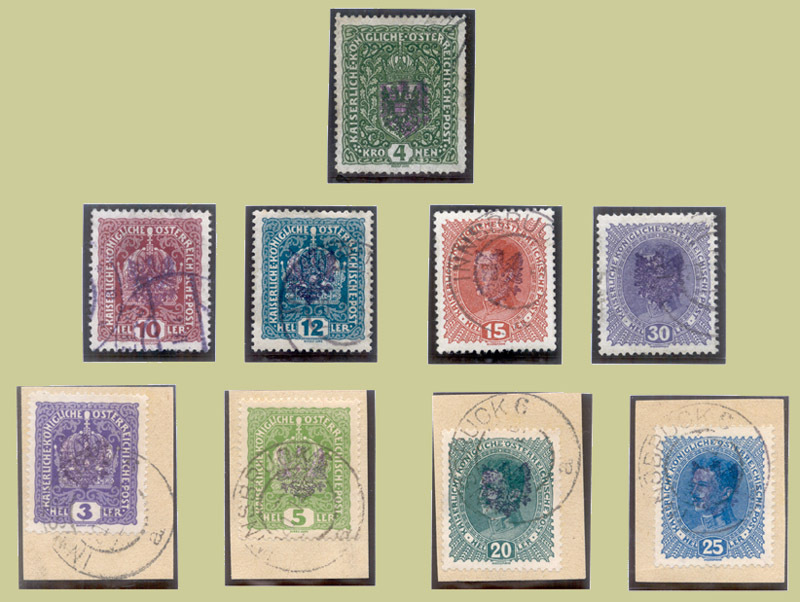 Ten values were selected, the number of each overprinted ranging from only 500 to 3,800 according to value. There were two issues. In the first, Type 1, the eagle’s tail is blunt and on the high values there is no hyphen between 'April' and '1921'. In Type II the eagle has a tail feather and there is a hyphen on the high values between 'April' and '1921'. This display presented the significant emergency and local issues produced in Austria during a particularly turbulent period of its history - the 2 or 3 years immediately after the end of the Great War. 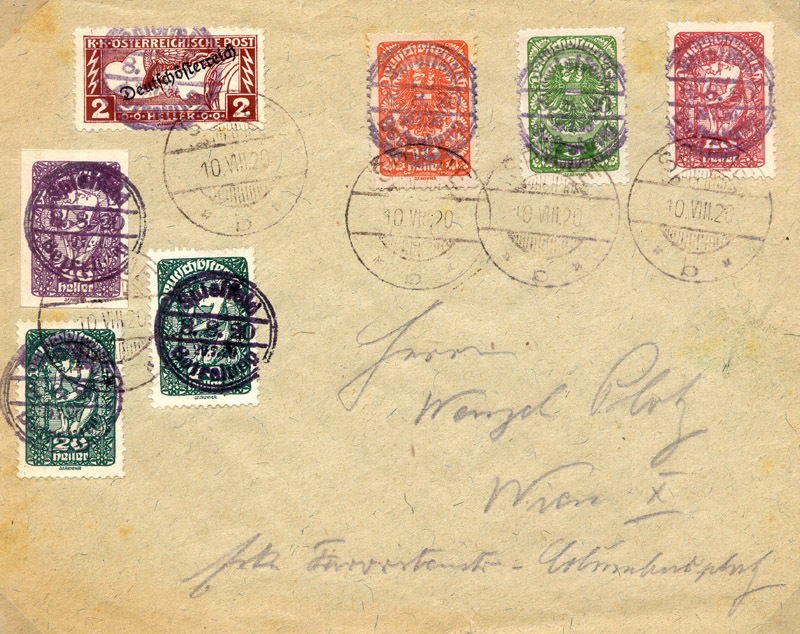 If it is accepted that the people responsible for them were at that time the local people in power, and that the stamps were actually used through the posts, then technical considerations of administrative and political procedures should not be allowed to detract from their legitimacy as a collectible for the postal historian.